However, with so many different platforms available and heavy competition on all of them, it can be difficult to set your brand apart and carve out your place on Twitter, Instagram and Facebook. If you’re not gaining any traction on some of the social media platforms you’re active on, it may not entirely be your fault. With hundreds of social media apps out there, and new ones popping up every day, it’s tempting to jump into all of them. However, every social network might not be the right fit for your company. Your job is to find the networks that align with your brand’s image and goals. Otherwise, you’ll struggle to make progress. For instance, if your company is a steel manufacturer, then Tumblr probably isn’t the best option for you. Tumblr’s primary demographic is teens and people in their early twenties. A better option would be LinkedIn since it’s a B2B network that attracts business owners. If you’re struggling to find out which social networks your target audience is most active on, take a look at these social media demographics to get the perfect starting point. Visuals play an important part in social media branding. If each of your profiles looks like they’re owned by a different company, it creates a disconnect for your users. You want your branding to be consistent across all channels. This will help people immediately recognize your company no matter which site or app they’re using. 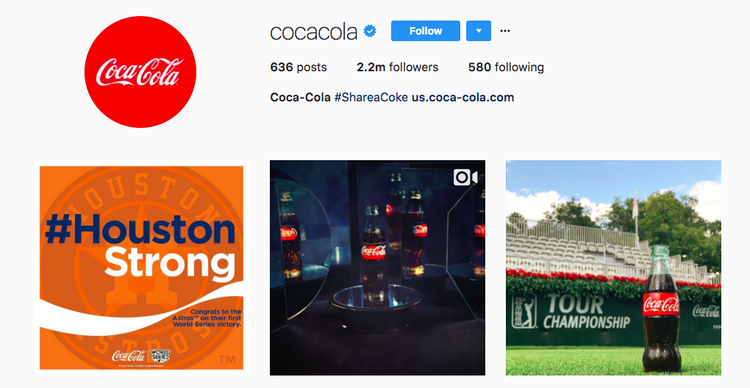 Choose a color palette: Coca-Cola uses its classic red and white color scheme across all social media channels. It doesn’t just stop at the logo. When you look at the posts the company shares, you’ll rarely find visuals that don’t include the color red. The easiest way to develop your color palette is to take a look at your logo. You want to get to a point where people associate those colors with your brand. Keep in mind that different colors can impact the way people perceive your brand. Use the same logo/avatar: You should try to use the same avatar for every social network. To keep things simple and consistent, use your logo or a symbol that represents your company. People should see your avatar and immediately associate it with your brand. Think about the Nike swoosh or the golden arches of McDonald’s. As soon as you see them, you immediately think of their brands. Filter carefully: Whenever you share images on Instagram or other visual channels, keep your filters consistent. Whether that means using no filters at all or Mayfair, choose one or two and stick to it. Using a different filter for every image you share makes your posts look unorganized and inconsistent. Here’s a cool Instagram hack to help you out. You can reorder and prioritize your Instagram filters based on the ones you use the most. Create templates: If you have a team handling your social media marketing efforts, it can be helpful to create templates for any graphics you share on social media. That way, your fonts, colors and designs will always be consistent. You can do this through Photoshop or use a free tool like Canva. Check out our article on how to create a social media style guide for more tips to keep your brand consistent across all your social channels. 1. Your company culture: What is the culture like at your company? Your culture is what you stand for, what your company is about and what makes you special. For example, Under Armour’s culture is all about performing to the highest level and being innovative. The use of hashtags like #IWILL in social media posts shows that the company’s social media voice is a direct reflection of its culture. 2. You audience: Speaking in a way that your audience connects with is very important. That could include using certain lingo and references that are popular in your target market. Taco Bell is constantly in tune with what’s popular with its audience (a younger demographic) and crafts its social media posts to fit that voice. 3. Authenticity: Whatever your social media voice develops into, make sure it’s authentic to your brand. Trying to sound a certain way just to fit in can backfire. 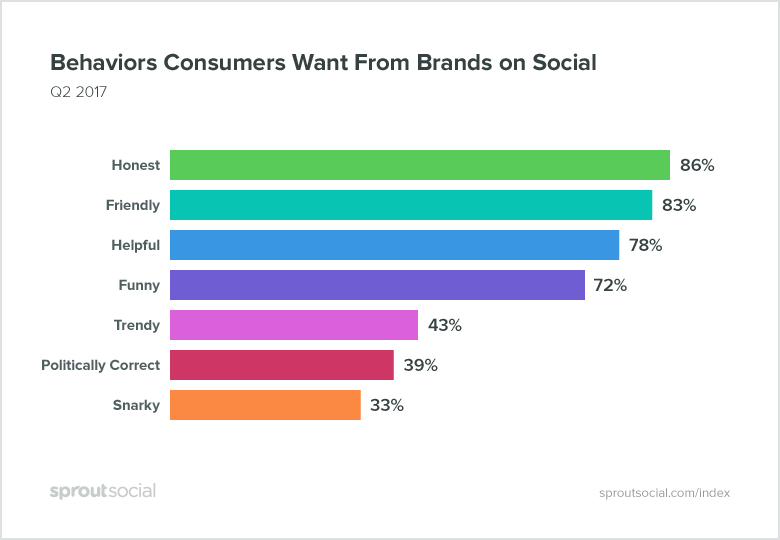 According to one of our recent surveys, honesty is the number one trait consumers want from brands on social. Taco Bell’s posts resonate with its audience because the company has been consistent and it feels authentic. Another example is WeWork. If you look at the WeWork Twitter account, you’ll find plenty of Tweets that speak directly to the company’s main demographic, which is entrepreneurs pursuing their passions. Their social media voice is genuine and authentic to the brand. Sites like Twitter, Facebook and LinkedIn are very good for content curation. Curating is a great way to help you build authority in your industry as well as provide a steady flow of social media posts that aren’t self-promotional. Finding blog posts, videos and other content to share with your audience sounds simple enough. However, many businesses go into it blindly without creating a strategy or guidelines for what topics to share. As a result, your Twitter Timeline can become filled with a random mix of Tweets about five or six completely different topics. Avoid that mistake by streamlining your efforts. Pick a few topics that are closely related to your industry. For instance, the popular career site Monster.com Tweets articles about employee satisfaction, career advice and workplace culture. All of these are directly related to its brand. If Monster started adding Tweets about investing and personal finance, it would seem out of place. But by focusing on its main areas of expertise, Monster’s brand has become a go-to account for people’s interest in career related content on Twitter. Nothing will kill social media branding efforts more than irregular posting. If you only Tweet once every few days or upload one new Instagram picture a month, you’re going to be forgotten. Shortened attention spans combined with rapidly growing social networks have made publishing more important than ever. How frequently you post is going to depend on your audience. It will take some trial and error to find out what works best for your brand. One of the best ways to determine how often you should post is to use Sprout Social’s social media publishing and analytics tools. 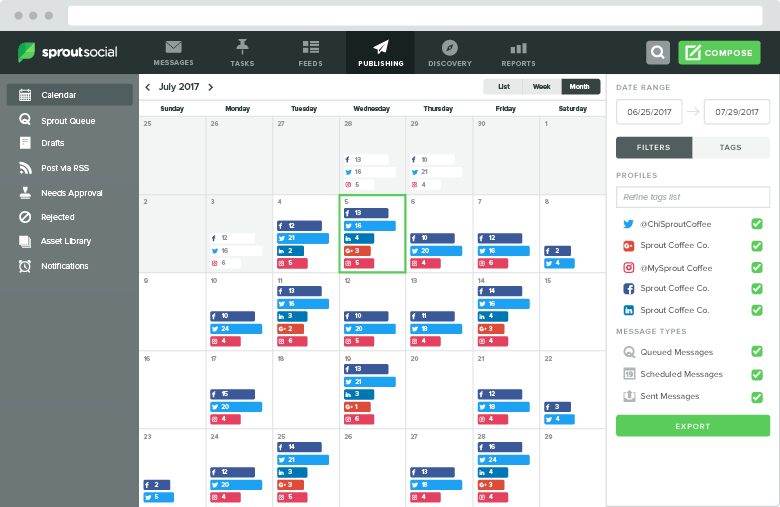 The publishing tools will allow you to schedule your posts to be sent out when your followers are most active. The analytics tools let you gauge which posts are gaining the most engagement. You might find that your Tweets get more engagement on the days that you post 10 times as opposed to five. Always track and review your social media efforts. 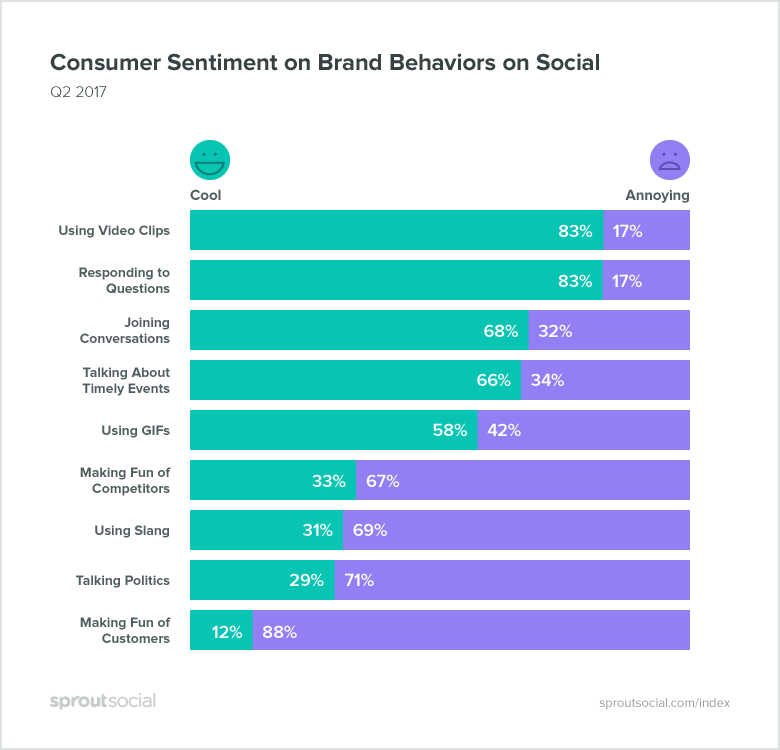 When companies like Nike and Starbucks post a new image on Instagram, they get a lot of engagement. That’s because they’re both established brands with millions of followers. If you’re just starting out or don’t have a huge audience, your content won’t get the same amount of attention since you’re relatively unknown. A good way to achieve faster results and amplify your social media branding efforts is to build relationships with influencers. Influencer marketing allows you to piggyback off the audience that established people in your industry have already built. 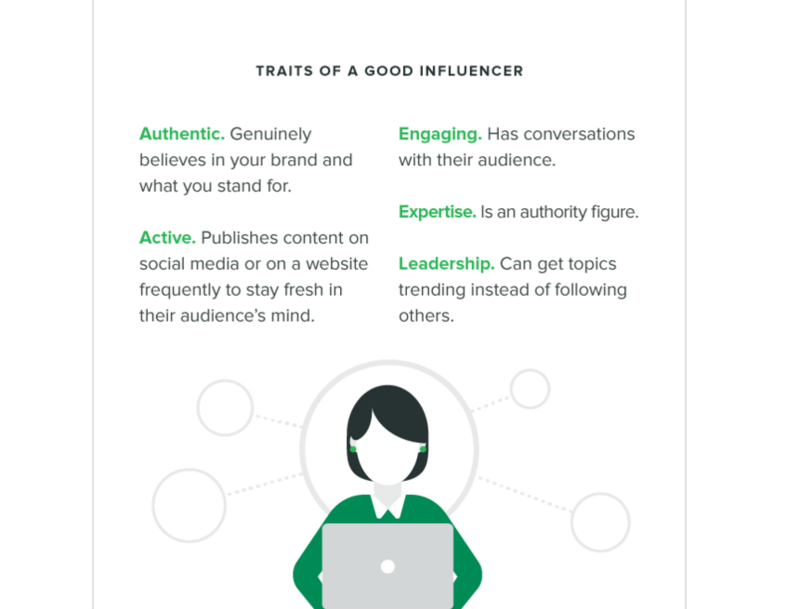 Since the influencer has already earned the trust and respect of their followers, getting a co-sign or mention from them carries a lot of weight. Don’t go into your marketing and social branding efforts alone. Start building relationships right away. Far too many brands make the mistake of letting their bio or profile section go to waste on social media. When you’re in the process of building your brand, letting people know who you are and what your company does is vital. Brands like Nike can have #justdoit in their profile because they’re well-established and people already know what they do. Most companies don’t have that luxury. Don’t fill your profile up with random hashtags or motivational quotes. Treat your bio like an elevator pitch. If you had to describe what your business does in one or two sentences at the most, what would you say? Here are a few examples of companies that use their bio sections effectively. 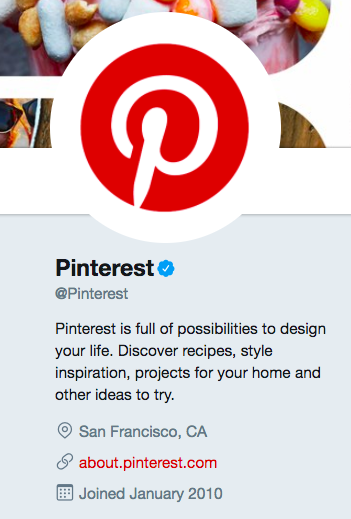 Pinterest clearly describes what the network is used for and mentions some of its most popular categories to give users an idea of the type of content people share on the site. 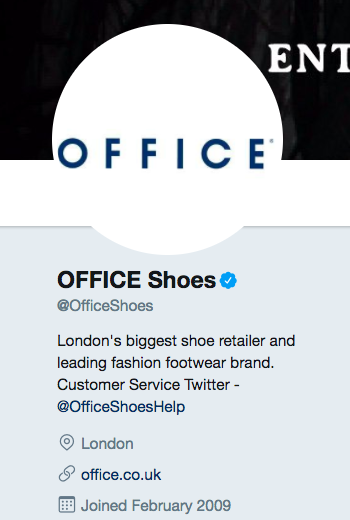 Office Shoes uses selling words like “leading” and “biggest” to convey that it’s the best in the industry. 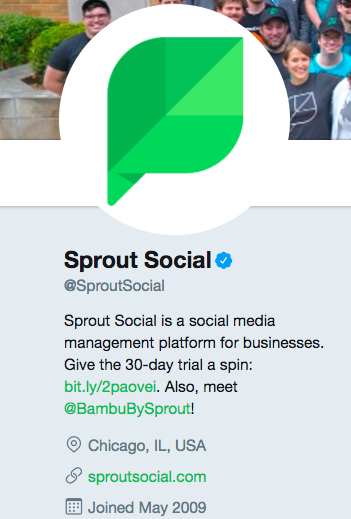 Sprout Social’s profile spells out what Sprout is, who it’s for and even works as a lead generation tool by offering a free trial. Take some time to go back and look over your profiles and bios across all of your social media channels. Are you making the best use out of them for your brand? One challenge that a lot of businesses have with social media branding is building initial traction. Getting your first few followers can seem impossible when you don’t even know where to start. However, if you’ve been in business for a while or have other Web properties (website, blog or other social media accounts) then you should start there. Unless you tell your current customers, colleagues and network that you have a Snapchat or Instagram account, how will they know? Never make the mistake of just assuming everyone knows about all your social media channels, even within your own company. 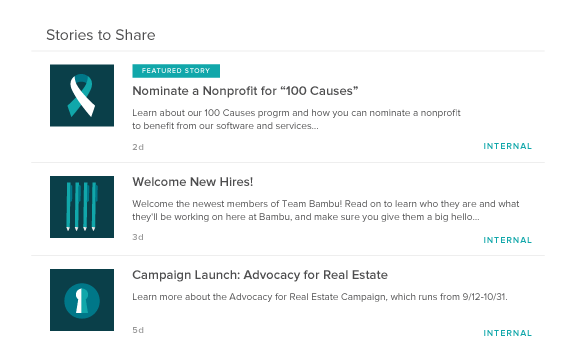 A good way to promote you social efforts internally is with an employee engagement tool like Bambu (a product from the Sprout team). For instance, if you just created an Instagram account and want to get some initial followers, send out a message on Bambu to your entire company and encourage them to follow you. Or you can create a pre-written Facebook post or Tweet for them to share with their own network to promote your new account. If the only time you post on social media is to share content, it’s like having a conversation with yourself. As we alluded to earlier, in the beginning stages, your brand will be unknown. You can start building awareness for your brand on social media by engaging and interacting with other users. It’s as simple as replying to Tweets and commenting on Facebook and Instagram posts. Some companies feel weird about replying from a company account. Don’t worry, it’s perfectly acceptable for companies to reply to each other on social media. For instance, Wendy’s isn’t shy at all about going back and forth with the competition on Twitter. Earlier this year, Wendy’s and Wingstop had an epic Twitter rap battle. The lesson here is that you shouldn’t be afraid to interact with other companies on social media, even if they’re your competitors. It’ll put you on their audience’s radar as well as theirs. Just make sure you keep it playful and respectful like Wendy’s and Wing Stop. Our data showed that 67% of consumers find it annoying when brands make fun of competitors. Trying to be active on eight or nine social media sites isn’t a good idea unless you have a social media team managing it all for you. It’s better to be excellent on two or three platforms than mediocre on seven. However, just because you’re only going to be active on a few doesn’t mean you can’t setup profiles on others. By claiming your company name on major social media platforms, you’re securing them in the event that you ever decide to use them. This is also beneficial for SEO. When people Google your company name, some of the results on the first page may be from sites like Facebook, Twitter and other social networks. 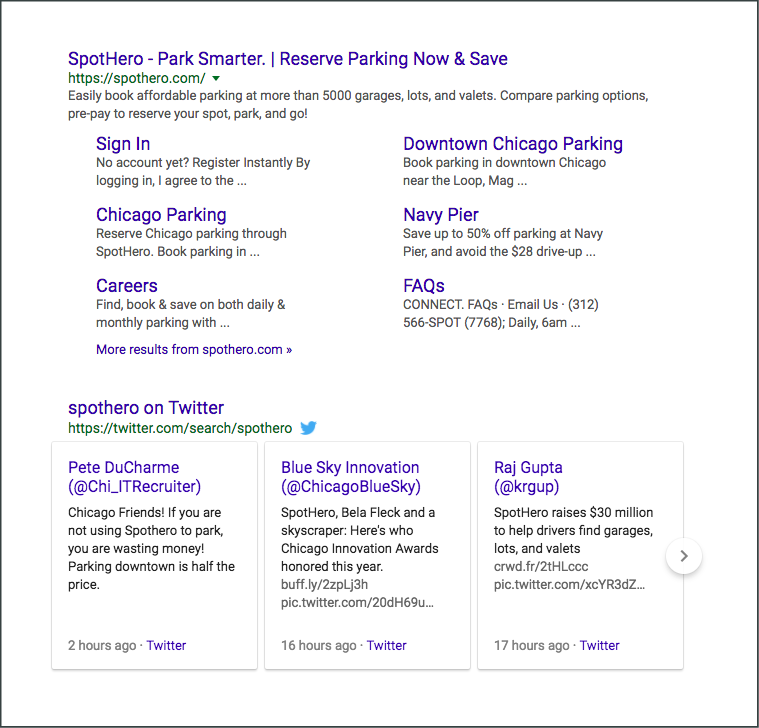 For instance, when you search for SpotHero, the second search result is a feed of the brand’s latest Tweets. If someone else has claimed the Twitter handle for your company name and is actively using it, it could confuse your audience if they Google you and another brand’s Twitter account pops up. You can use a tool like KnowEm or Namechk to do a search for your company name across popular social networks and see if the username is available. On a similar note, keep your usernames consistent. You may run into a situation where your company name is taken on a social network. When that happens, create a variation that you can use across any other social network that doesn’t have your company name available. Having a different username on each platform creates inconsistency, which hurts your branding efforts. As social media marketers, it’s easy to focus on the content you share and growing your number of followers. But take a second to think about the connection between social media and your brand first. Prioritizing social media branding will help you connect with your target audience, be more strategic with your efforts and get better results.